Ariel Winter is best known for her role as middle sister Alex Dunphy on ABC's long-running hit comedy series "Modern Family." The show is now in its eighth season, and when Winter started on it she was just a kid. Now, the actress is 19 years old and has become an icon of body positivity, despite recent criticism online. Scroll through to watch her evolution over the years. 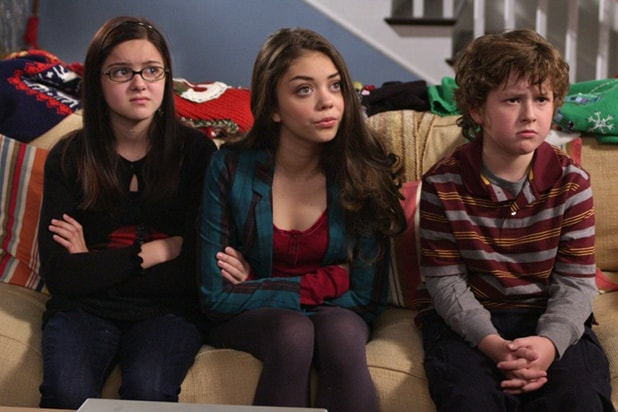 Winter is pictured here next to her co-stars and onscreen siblings, Haley Dunphy (Sarah Hyland) and Luke Dunphy (Nolan Gould). When the show started in 2009, Winter was 11 years old. Winter poses at the KIIS FM Jingle Ball in 2010. In 2010, Winter shows off her braces with a big smile. This is the first selfie posted on Winter's Instagram, posted in 2012. This picture of Winter and Gould was taken at the 2013 SAG Awards. Winter posted it on her Instagram with the caption "Love my fake little brother!!!! :) #sagawards2013 #fakebrother #saglove"
Here, Winter poses with one of her "idols" Miranda Kerr at the 2013 InStyle Golden Globes afterparty. Winter is pictured here with other "Modern Family" cast members at the Emmy Awards in 2014. The show won that year for Outstanding Comedy Series. Winter posted this photo to her Instagram in 2014. "I went swimming with dolphins in Cabo! I LOVE them! Such an amazing experience," she wrote in the caption. In 2015, Winter attended the International Women's Media Foundation Courage Awards in Beverly Hills. Winter poses at her high school graduation party in June 2016. The actress will be joining the 2020 class of the University of California, Los Angeles. Winter poses for a Twitter swimsuit selfie while vacationing with her sister in Arizona last summer. Last year at the 22nd Annual Critics' Choice Awards, Winter sports new fringe alongside her co-stars Gould, Hyland, and Jesse Tyler Ferguson.